Date of birth unknown. 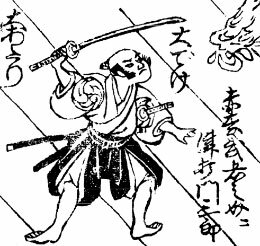 He started his career in Edo around 1747 as a disciple of Tsuuchi Monzaburô I, who gave him the name of Tsuuchi Monjûrô. He performed as a katakiyaku in the 11th lunar month of 1747 at the Moritaza in the kaomise drama "Aruji Môke Onna Hachinoki", which celebrated the shûmei of Sawamura Sôjûrô. He became tachiyaku and took the name of Tsuuchi Monzaburô II in the 11th lunar month of 1754 at the Nakamuraza, playing the role of Kisanta in the kaomise drama "Miura no Ôsuke Bumon no Kotobuki" which celebrated the shûmei of Ichikawa Danjûrô IV and Matsumoto Kôshirô III. He went to Kyôto in Fall 1755 and played in the 11th lunar month of 1755 at the Kitagawa no Shibai the role of Tôkurô Morinaga in the kaomise drama "Onna Monji Heike Monogatari". He switched back to katakiyaku roles, took the name of Tsuyama Yûzô II and played in the 11th lunar month of 1756 at the Kitagawa no Shibai the role of Tatsutayama Daizen in the kaomise drama "Ukematsuri Hôrai Yakata", which was produced by Somematsu Matsujirô. He went on tour in Ise and Nagoya in 1757 and went back to Edo in 1758, where he performed in the 11th lunar month of 1758 at the Nakamuraza in the kaomise drama "Kigoto no Hana Aioi Hachinoki", which celebrated the shûmei of Mizuki Tatsunosuke III. He became a travelling actor, performing in tabi shibai under the name of Yamashita Ridai. He went back to Edo and became sakusha. 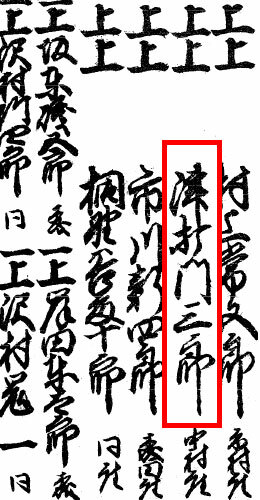 He worked, under the pen name of Toyomi Ridai, in the 11th lunar month of 1770 at the Nakamuraza for the tatesakusha Sakurada Jisuke I on the kaomise drama "Nue no Mori Ichiyô no Mato", which celebrated the shûmei of Ichikawa Danjûrô V, Matsumoto Kôshirô II, Nakamura Shôchô, Ichikawa Monnosuke II and Nakamura Shichisaburô III. He became tôdori at the Moritaza at the end of the Meiwa era. 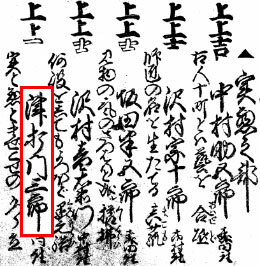 He took the name of Hamaji Ogio and worked at the Moritaza in the 11th lunar month of 1775 on the kaomise drama "Kikujidô Shuen no Iwaya". He became sanmaime sakusha in 1776 and worked at the Nakamuraza in the 11th lunar month of 1776 on the kaomise drama "Sakuya Kono Hana no Kaomise". He took the name of Hamaji Matoo II and worked at the Moritaza in the 11th lunar month of 1777 on the kaomise drama "Hito no Kuni Yori Mitsugi no Irifune" which celebrated the return to Edo of the actor Sawamura Sôjûrô III. No record afterwards. Date of birth unknown. He started his career in Edo at the beginning of the 1760s, performing as a jitsuaku actor. 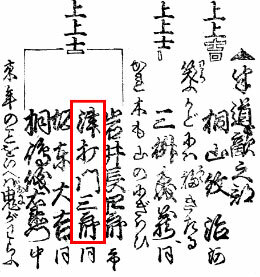 He held the name of Tsuuchi Monzaburô but was not acknowledged as an official holder of the name. He was active up to 1768. No record afterwards. Dates of birth and death unknown. He started his career in 1799 in Edo as a disciple of Ichikawa Danjûrô VI. His first stage name was Ichikawa Danshichi I and he was a tachiyaku actor. He took the name of Tsuuchi Monzaburô III in the 11th lunar month of 1816 at the Kawarasakiza, where he performed in the kaomise drama "Kiyomori Eiga no Utena", which also celebrated the shûmei of Sôryô Jinroku II, Ôtani Bajû II, Sakata Hanjûrô, Bandô Matajûrô III, Ichikawa Momotarô I and Ichikawa Kodanji III. He performed for a while in Kamigata. He was mainly a handôgataki. He was active up to 1829. No record afterwards.